Flourless desserts are always popular in a gluten free kitchen, because no flour means no gluten. Or at least it usually does. Now this cake does have a secret ingredient. Please stay with me on this one because really this cake is so good. My whole family enjoyed it. This cake has beans in it. Yes, beans. Navy beans to be exact. Now, I know it is odd, and I am not normally a fan of bean flours in my gluten free recipes, but in this beans worked. The beans kept it moist and since you pureed it the texture worked. It really did. Now, it did not taste like a rich chocolate over the top type dessert. 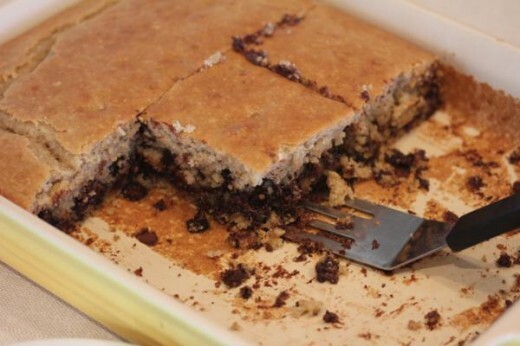 This flourless chocolate chip cake was more like a healthy cake, but it was very good. It reminds me of my flourless brownies that contain beans because it taste like a dessert, but a healthy one. I will be making this one again and again. 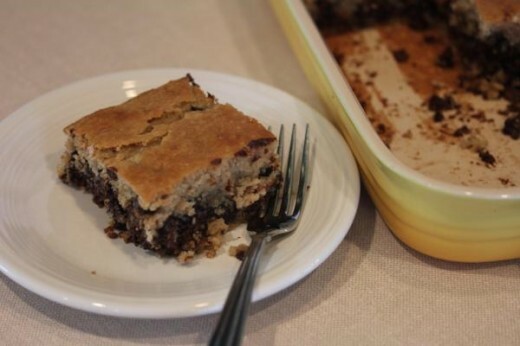 I love dessert and anytime I can make a gluten free dessert without a bunch of extra ingredients and have it be a little healthier, I am all for it. 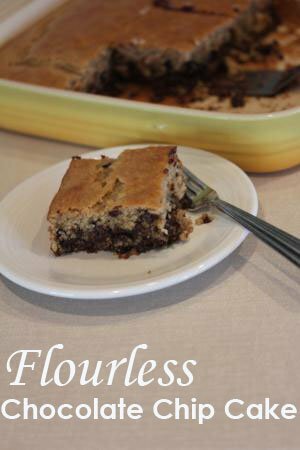 Have you made any flourless desserts with beans? I would love to hear what things you have made with beans? In a food processor grind oats until fine, similar to flour. Add remaining ingredients, except chocolate chips. Pulse/blend until well combined. You want this fairly smooth. Spread into a greased 9×13 pan and bake at 350 degrees for 35-40 minutes. Let stand for 30 minutes before serving. Note: I have used my vitamix to blend this, so if you have a really heavy duty blender, like a vitamix, it will also work in place of a food processor, but be sure your blender can handle it.